Combining the piety of the Blessed Virgin with the feminine strength of Cleopatra, the Empress Helena is one of the most interesting figures from late antiquity. Born in Dalmatia in the mid-third century, she married an officer in the Roman army and bore him a son, who would one day become the Emperor Constantine. When her husband acquired more power, he divorced her to marry on a higher social level, a common occurrence at the time and one she bore gracefully. However, when her son became the undisputed leader of the Roman Empire in 312, she was given the title Augusta and held a role similar to that of a queen mother. Connected to her title, she was given the Sessorian Palace, originally built under Commodus and Septimus Severus in the late second century. 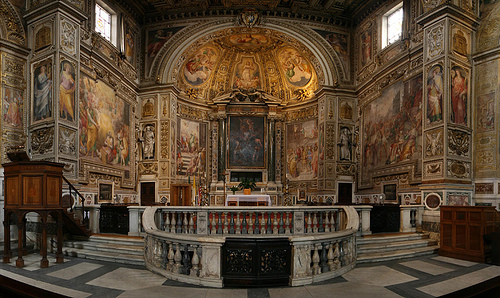 It is the modified form of the great hall of this palace that now forms the central part of the present basilica. 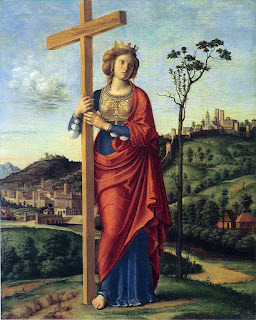 The connection between St. Helena goes far further than simply having lived here, for tradition recalls how she made a trip to the Holy Land in 325 in order to bring back relics from the life of our Lord for veneration in the West. These were later placed in a chapel behind the apse of the basilica, which had recently been adapted for Christian worship. 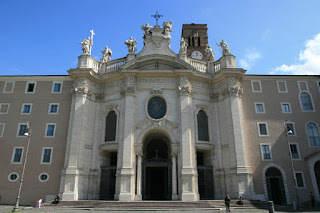 The basilica officially remained state property until at least the year 500, although worship and other ecclesiastical events took place in it during that time. A renovation took place in the early eighth century, being followed by a more complete one in the mid-twelfth century. 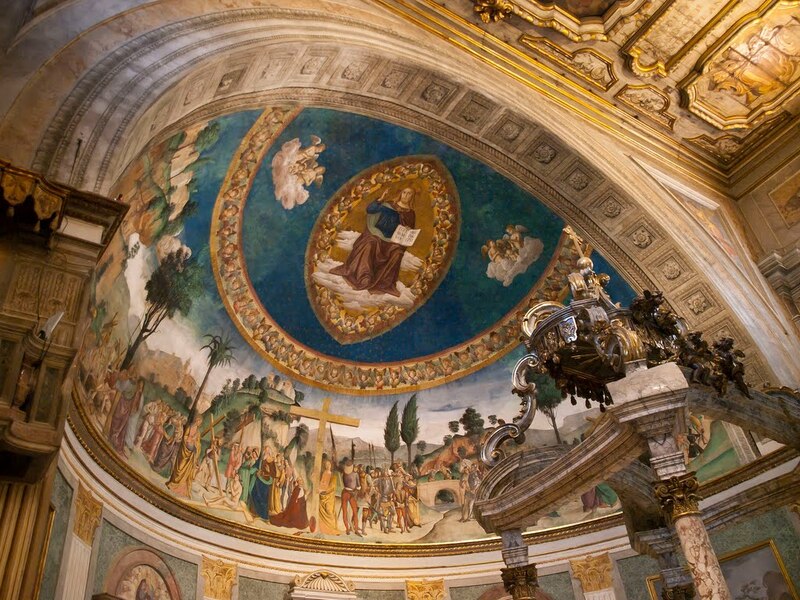 In the late fifteenth century a restoration was carried out, including the creation of the apse fresco. 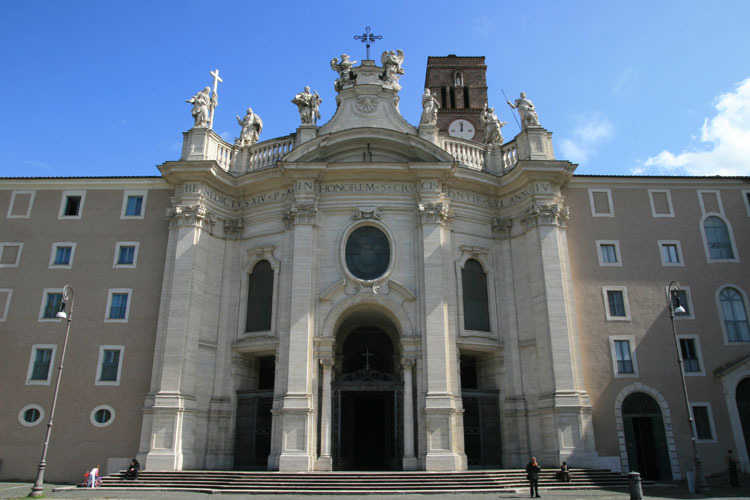 The current façade and narthex of the basilica date from 1733-34, being commissioned by Pope Benedict XIV. He also made some changes to the interior, among other things rebuilding the roof and ceiling which still bears his name and erecting a new ciborium above the main altar. 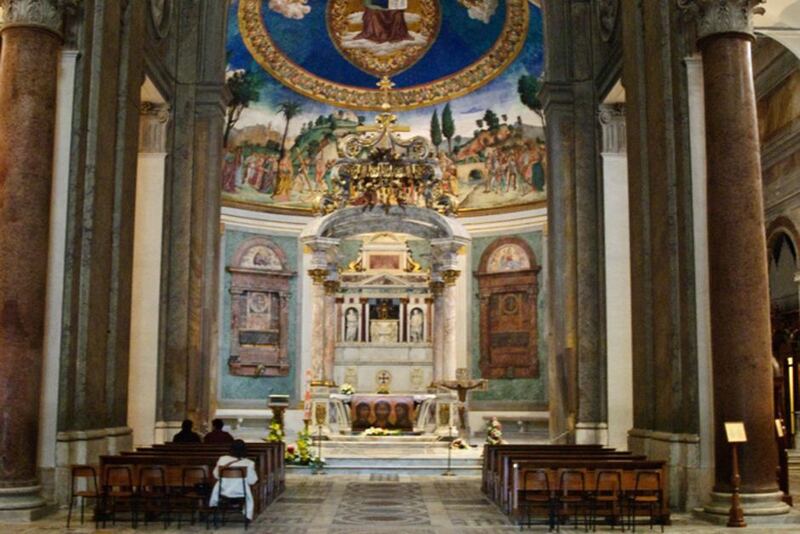 The sacred relics of the Passion are currently kept in a chapel above their previous home, opened in 1930 and finished in 1952.